Haiku Mill, in the lowland tropical setting of Northshore Maui has to be one of the most elegant ruins this side of Rome. 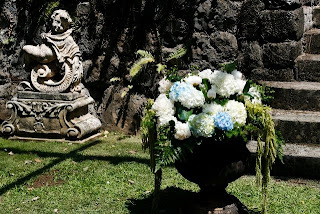 The location (see map below) is perhaps one of the best off-beach places to get married on the entire island of Maui - the ambiance reminds me, an old time kama'aina from Oahu, of days long ago when Hawaii wasn't a resort, but a series of estates, plantations and neighborhoods. Clarissa's eye behind the camera caught the time shift perfectly, as here to the left, the freshness of flowers, by definition a slice of the immediate, is held in the long frozen grasp of an ancient child who never escaped the stone. WritinginLight.com is where you can contact her. The entire shoot, the entire wedding itself was a continuing contrast between what was, what is, and of course, what is promised. 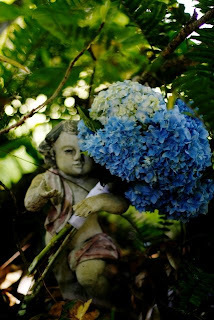 That is what makes Haiku Mill, fresh flowers and a magical wedding such a beautiful combination. Let Della, the master florist at Dellables.com, participate in your attempt at the magic.